Weekly 1.5 - 2 hours at a riding pace of 20-24km/h (13-15mph). May be hilly. This is a bridging ride at the upper level of the range to allow riders to gauge their pace and gain confidence to step up to the next star level. For those who missed out on the chance to climb Chain Hill, due to rain a couple of weeks ago, here is your chance to relive a Wantage classic! (Thats 525m climbing in 44.6 km). We'll be climbing Chain Hill and down to West Ilsley. From there we'll head over to Catmore, up past Brightwalton and Woolley to the A338 climb to the Ridgeway. From there we'll head down to the Letcombes and back up Windmill Hill to East Challow. The hard work behind us, we head back to Denchworth for a well earned pub stop (for those of that persuasion!). A second attempt at this ride and I still haven't led the route I mapped - third time lucky?! 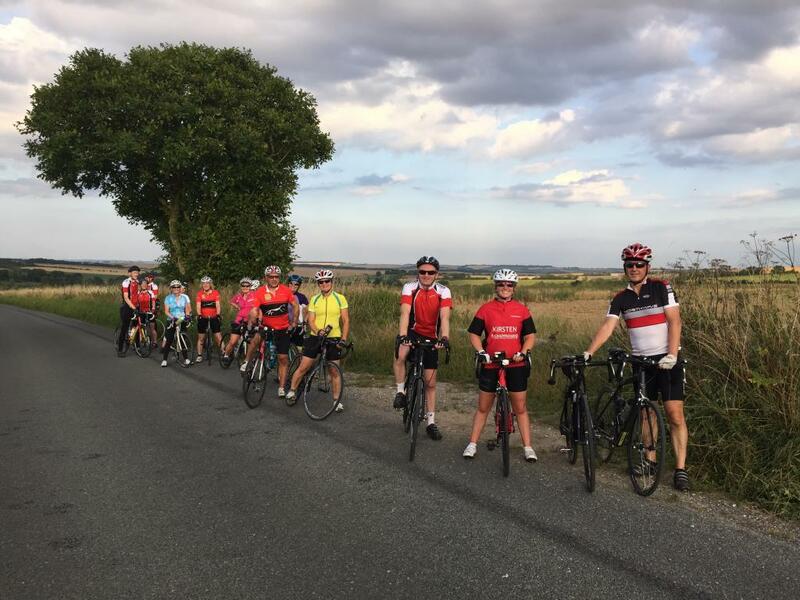 A large group of 17 riders set off from Grove to enjoy a great evening, with lovely views across the vale and neighbouring Downland. The riders up the long climb of Chain Hill were rewarded with a 'halo of flies' (Alice Cooper - Killer 1971) at the regrouping point. Then down the fantastic descent to West Ilsley via Farnborough where I didn't get a puncture - Yay!. John, however, did have a mechanical which caused him and Nick 'the sweep' an unfortunate delay, which meant they didn't see us turn right to Catmore. After a longish wait Andy volunteered to go and investigate while we carried on. Kirsten led the way up most of the remaining climbs on her NEW BIKE, which got the tongues wagging behind me. The earlier delay meant that we arrived back to the Ridgeway at 8.15 and a decision was made to head back to Denchworth via route 1, rather than the more scenic Court and Windmill Hills. Andy, who wasn't party to this decision, however did enjoy the planned route (plus an unplanned visit to Chaddleworth!). Despite him riding 15km more than the rest of us he managed to have his dinner served and eaten before mine showed an appearance! Great ride John, Charm third time lucky! !